Andele is a favorite with locals, and having seen it recommended various places I was anxious to try it. Andele often seems to be described as the "anti-La Posta," serving authentic Mexican food rather than the "tourist" version. 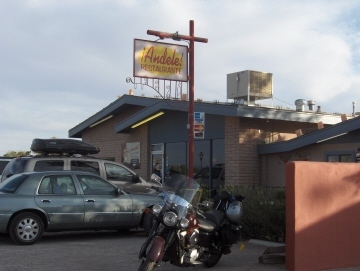 I did find Andele to be authentic, but in a way that is different from other restaurants. While many restaurants in the Las Cruces area specialize in ways to serve the local red and green chiles, Andele is focused more on food from south of the border. Its specialty is Tacos al Carbon-- I was told these are made with meat that is put on a stick and cooked in a rotisserie. I tried the chicken tacos, and they were delicious-- almost to the point that I had never experienced before. The extremely tender white meat can be topped with some lettuce and tomato served with the tacos, lime, and any of four kinds of Mexican style salsa served at the salsa bar. I told the waitress I did not want to make an entire meal of a meat item, but I wish I had made a meal of these-- I don't think I have found any tacos al carbon this good in El Paso or Juarez. I also ordered Red Enchiladas, and even though they were stacked I did not think they were very memorable. The Chile Relleno did not come close to the ones served at Chope's. I tried it with chile on top, but I doubt if my opinion would change if it were served plain, as at Chope's. For most items I thought I could find better elsewhere around Las Cruces, but the tacos al carbon were fantastic.